PilotE² Heating Analyzer Portable is a portable device to measure, log and analyze energy efficiency parameters of a heating plant such as boiler rooms or solar thermal energy plants. 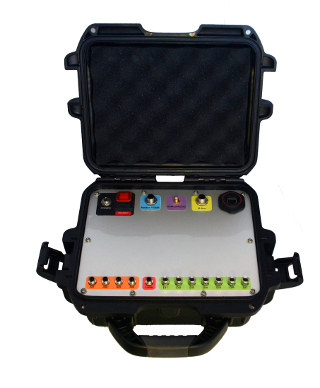 Rugged carrying case and waterproof, IP67 closed and IP65 open. With standard wiring system M8 and M12. Up to 10 M-Bus heat meters, electric meters or pulses counters. RS485 port with Modbus protocol. Wired and Wireless Connectivity: Ethernet and GSM / GPRS / EDGE / 3G. In SQL databases and CSV files in internal FLASH memory 1Gb or SD/MMC card up to 2 Gb. Data downloading via FTP / HTTP. With integrated real-time monitoring which can be accessed using a standard Internet browser from any computer or smart mobile Web. With the Energy Management System DEXCell Energy Manager, which makes it a powerful tool to analyze energy efficiency. Temperature sensors with active 4-20mA output with or without LCD display, immersion or contact. IP65 rating. Temperature sensors with passive Pt100 output, immersion or contact. Expansion module for 8 analog active inputs 4-20mA or 8 Pt100/Pt1000 temperature inputs. 1-wire temperature sensor, inmersion or contact. Pressure sensors with active 4-20mA output with or without LCD display. Wiring and installation material for sensors. effiautomation © 2015.Todos los derechos reservados.